OSAKA, JAPAN -- Against a monumental backdrop of bad publicity for cold fusion since 1989, researchers in Japan on May 22 demonstrated the production of excess heat and helium-4, the results of an historic low-energy nuclear reaction experiment. The mastermind behind the demonstration is Yoshiaki Arata, a highly respected physicist in Japan who has been the recipent of Japan's highest award, the Order of Cultural Merit, and is the first person to have performed a thermonuclear fusion experiment showing large amounts of d-d reactions in Japan. A lecture by Arata preceded the demonstration before a live audience in Arata Hall (named in his honor) at the Joining and Welding Research Institute at Osaka University. The demonstration took place in the Osaka University Advanced Science & Innovation Center with the help of Arata’s associate, professor Yue Chang Zhang of Shianghai Jiotong University. Professor Akito Takahashi of Osaka University was an eyewitness to the demonstration. 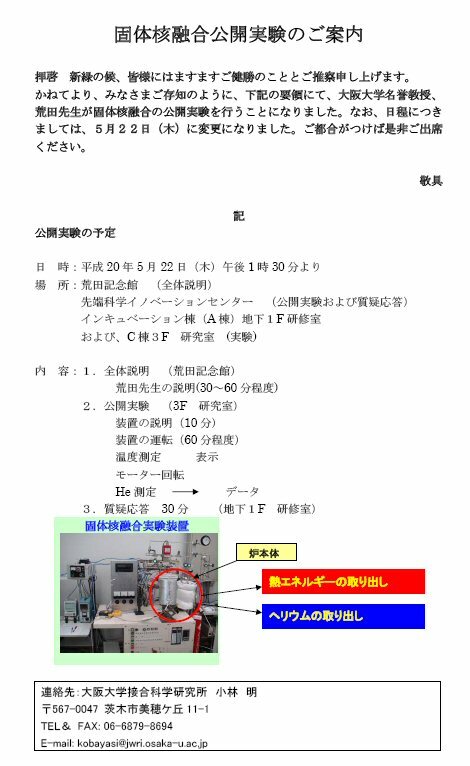 "Arata and Zhang demonstrated very successfully the generation of continuous excess energy (heat) from ZrO2-nano-Pd sample powders under D2 gas charging and generation of helium-4," Takahashi wrote. "The demonstrated live data looked just like data they reported in their published papers (J. High Temp. Soc. Jpn, Feb. and March issues, 2008). This demonstration showed that the method is highly reproducible." Takahashi wrote that 60 people from universities and companies in Japan and a few people from other countries attended, as well as representatives from six major newspapers (Asahi, Nikkei, Mainichi, NHK, et al.) and two television stations. 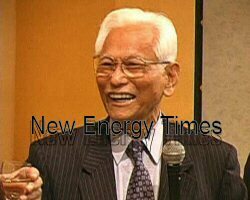 In an earlier conversation with New Energy Times, Arata offered his perspective on "cold fusion" research, which he calls solid nuclear fusion. New Energy Times will have a more complete report in the next issue on July 10.